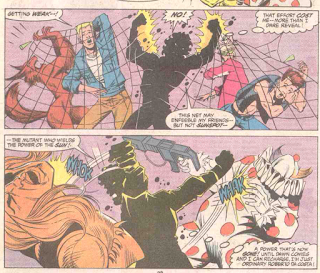 The New Mutants encounter a group of Skrulls posing as carnies. Cable and Rahne train in the Danger Room, but when Cable switches sequences to one involving a carnival, Rahne freaks out, as it reminds her of an earlier New Mutants adventure. 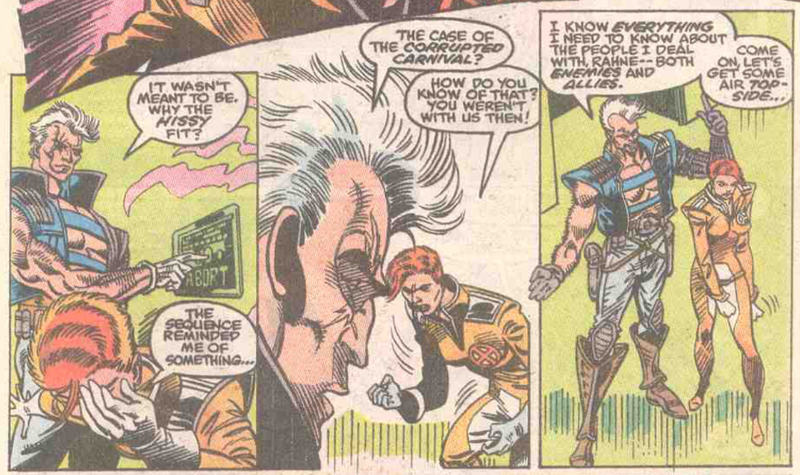 Cable, aware of that, had triggered the sequence as a psychological test, and Rahne proceeds to tell him about the case. 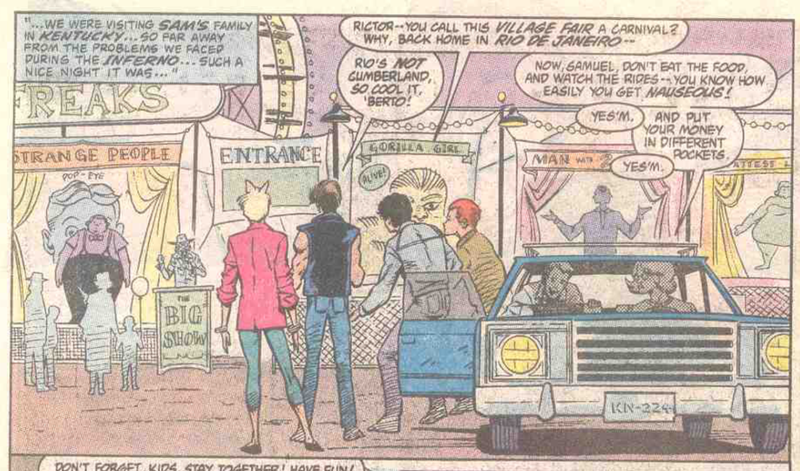 The New Mutants, while visiting Sam's family in Kentucky, had attended a local carnival. As they enter, they are noticed by a few of the carnies, who realize the New Mutants are super-powered, prompting the Carnies to test them. 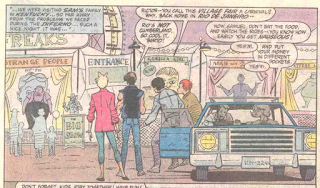 Rahne is then entranced to wanting a plush bear, and each of the New Mutants in turn try to win it for her. Once she has the bear, she grows sick, and Rictor stays with her at the First Aid tent. But the pair are quickly knocked out, just after being told they are the property of Skrull slavers. They awaken to find themselves shrunk in size and trapped in a display case with other captured carnival goers. Meanwhile, Sam, Roberto and Boom-Boom enter the fun house. When Rictor spots them from the display case, he uses his power to draw their attention, just as a demon-like alien attacks Boom-Boom. They realize her attacker is an actual alien just as Rictor frees all the shrunken captives. 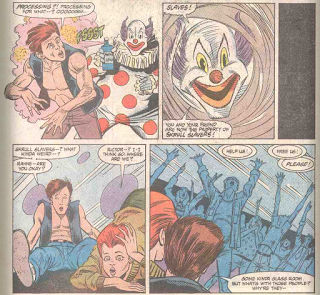 The New Mutants, including the re-growing Rahne and Rictor, rush for the exit, but are blocked by the two Carnies and a cadre of circus animals, who are transformed Skrulls as well. The New Mutants fight their way free, and when the police, drawn to the commotion, arrive, the Skrull slavers are forced to flee, the entire carnival transforming into their spaceship. Back in the present, Rahne admits her time with the New Mutants has made her realize there are few truly innocent places left in the world, though Cable insists she should never stop hoping otherwise. This represents the first fill-in issue of Rob Liefeld's tenure on the series, and it won't be the last (he does provide the cover to the issue, which, as the cover itself points out, spoils the reveal that Skrulls are involved). This is a pure fill-in issue, in that neither the writer nor the artist are the series' regular creators. Presumably, this was an inventory story that got slotted in when Liefeld fell behind, with the framing sequence presumably added once the story got slated for print. The Skrulls in this story are stuck in the forms of various carnival players and animals, the forms they were in when the Great Disaster happened, a reference to Avengers Annual #14 and Fantastic Four Annual #19, in which a mad Skrull emperor detonated a genetic bomb which robbed the Skrulls of their ability to shapeshift, leaving the entire race stuck in whatever form they were in when the bomb went off, a condition that will also be used as a plot point in a late 90s X-Men storyline. This issue also includes another pinup of the New Mutants, still including Rusty and Skids (suggesting Liefeld either still thinks he's going to get back around to doing something with them, or that this was drawn before his tenure, when they hadn't yet been written out). Art comes from Bob Hall, a journeyman artist of sorts from the late 70s and 80s. He never had a lengthy run on any specific title, but filled in on various series fairly regular, including drawing a half-dozen issues of Avengers scattered throughout the 80s and the original West Coast Avengers limited series. It's tough to place exactly when the main story of this issue took place. 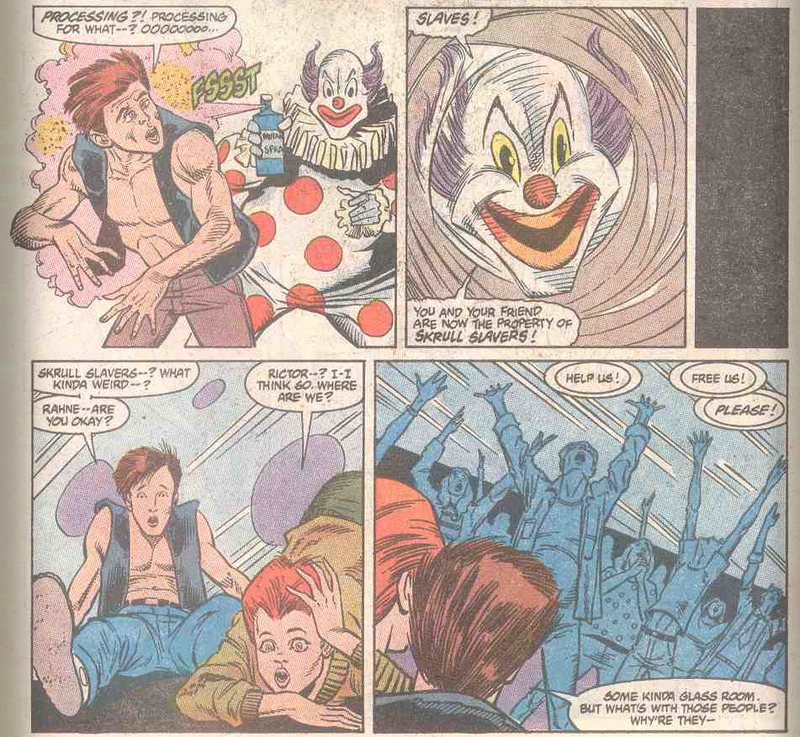 Rahne references the New Mutants' trip to Kentucky as being a welcome break from the madness of "Inferno", suggesting it takes places sometime between issue #76 and #77, yet Dani, Warlock, Rusty, Skids and young Illyana, all of whom were with the team at that time, don't appear in the story. Maybe they stayed behind on Ship while the rest of the team visited Sam's family, for whatever reason? Cable refers to the events of this issue as "The Case of the Corrupted Carnival", which is a little too Hardy Boys-esque for the X-titles (I can see, say, the Avengers referring to a specific story by a case name, but the X-Men have always seemed more casual than that). There's a cute bit at the beginning where Sam gets mothered as the New Mutants are dropped off at the carnival. 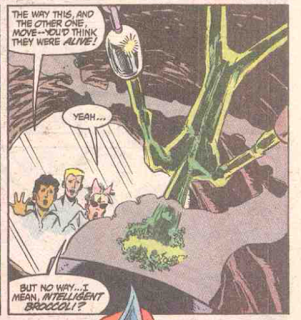 One of the aliens the Skrulls have captured is a broccoli-like alien; not sure if this is meant to be a reference to the Asparagus aliens that Dark Phoenix wiped out or not. A plot point that surprisingly doesn't get used as often you'd expect to, at one point in the story, Roberto uses up his store of solar energy, leaving him powerless until the sun comes back up in the morning (though he's still Sunspot-y when he says it...). Even though he wasn't a member of the team when the events of the main story took place, Cable is aware of it, saying he makes a point of learning all he can about the people he works with. 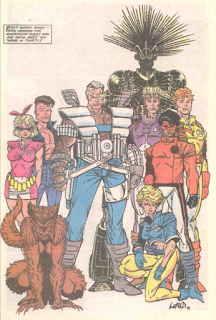 Given how notorious Rob Liefeld is for missing deadlines (it takes a long time to draw all those lines, obscure all those feet, and star in a Levi's commercial, apparently), it's surprising that he made it a full six issues on New Mutants before needing a break, but nevertheless, here is the first of those breaks. As a fill-in inventory story, this is perfectly fine. 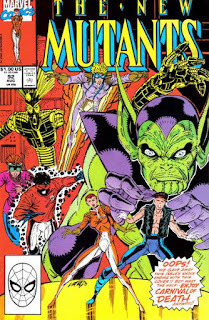 The idea of Skrull slavers, masquerading on Earth as members of a carnival (including its animals) only to get stuck in those forms is a fun idea (basically, any time the various X-characters end up fighting Carnies, alien or otherwise, is a win in my book), and while there's no terribly compelling reason for the New Mutants to be involved in this story (despite the efforts of the framing sequence to generate some meaning from it), that's a lot less egregious of a criticism for a time-killing one-off inventory story. In fact, the biggest sin of this story is probably that its entirely forgettable and throwaway, neither bad nor good enough to merit much comment, other than to be disgruntled that its existence robs the world of one more Liefeld-drawn issue. Tomorrow, the Right returns in X-Factor #57. Next week, the debut of Gambit in Uncanny X-Men #266, and the return of Galactus in Excalibur #25. Say what you will about Liefeld, I think the pinup in this issue is a great example of his art, before he got got caught up in his art ticks. His Warlock does not work for me, but that probably why he's not on the team for much longer. @branden I was just going to say the same thing. That's some of the best Liefeld art I've ever seen. It's not a million miles away from Art Adams. It's a shame he couldn't do that on a regular basis. Ditto! As much as I enjoy Liefeld's X-Factor, when I look at that pinup I shed a tear for what might have been. Also, I have a huge crush on Skids. 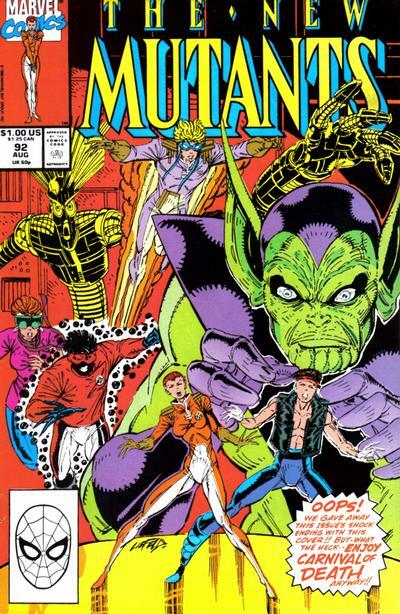 > This issue also includes another pinup of the New Mutants, still including Rusty and Skids (suggesting Liefeld either still thinks he's going to get back around to doing something with them, or that this was drawn before his tenure, when they hadn't yet been written out). Next to his signature, I see the pin-up is dated 1989. Liefeld's first issue (#86) was cover dated February 1990, so it would have been on sale in December. I'd say it was, definitely, drawn before his tenure, at a point when he assumed that both characters would, still, be part of the main cast. I’m pretty sure Joe Rosen lettered the framing sequence, uncredited. That illustration’s definitely the most appealing piece of Liefeld art in the series so far. I was surprised to see his signature sitting there alone, with no inker, because Cable’s face looks so… normal. Spoilers on covers is probably my all-time biggest pet peeve re:comics. It would piss me off to no end, were I the writer.At least they pointed it out on this one. Yeah, that is a really nice piece. As Jeff says, you can definitely see the Art Adams influence, which is probably the difference between having the time to do a pin-up vs. the grind of a monthly book. @Cerebro: I'd say it was, definitely, drawn before his tenure, at a point when he assumed that both characters would, still, be part of the main cast. Makes sense (I didn't pay attention to the '89 signature). That definitely fits with his other early sketches that included them as well. Yeah, I bet that's a special kind of gear-grinding for comic book writers.